Sam Collins wants to make his York City side “hard to beat” after he was appointed as manager on a permanent basis this week. City travel to second-bottom Southport today having won four of their last three outings in all competitions. The only blip in their current run was a 2-2 draw with third-bottom Nuneaton Town. And with Southport yet to win a home league game in five attempts, Collins insists that his players won’t be taking things lightly. “We have got good footballers, we know that,” said Collins. “Watching the way that Southport play we know we will have a lot of the ball. Third-placed Bradford Park Avenue could move into second spot when they host Kidderminster Harriers. Park Avenue have won back-to-back games but were beaten 4-2 by Altrincham in the FA Cup last weekend. Kidderminster have lost just one league game all season, against fifth-placed Chester, and sit two points and one place ahead of Bradford heading into tomorrow’s fixture. Elsewhere, Kayedi Odejayi may just be over four months away from his 37th birthday, but no-one can say that his impact is waning at Guiseley. Quite the opposite in fact, with the much-travelled targetman’s nous, strength and experience still proving invaluable for the Nethermoor outfit, according to joint-manager Marcus Bignot. Odejayi showed he was up for the cup in midweek, helping his current club to the fourth qualifying round after netting the decisive goal in a 2-1 replay victory over plucky Cleethorpes Town. 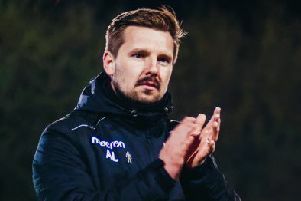 He is likely to be important over the coming weeks too for Guiseley, with the mid-tablers returning to National League North business at home to Brackley Town today. “We are really decimated in terms of injuries,” said joint-manager Marcus Bignot.